Jennifer is a 1978 American horror film directed by Brice Mack, starring Lisa Pelikan. The story has some similarities to the 1971 film Willard, about a social outcast with the ability to control rats, as well as the 1976 film Carrie, about a similarly awkward and vengeful misfit who develops psychic abilities. Jennifer Baylor (Lisa Pelikan) is a poor, red-headed young woman from West Virginia. Jennifer possesses a power over snakes, an ability to control them and communicate with them. She and her father, Luke Baylor (Jeff Corey), left their home in disgrace, because when Jennifer was 7, some snakes she had been handling killed the town preacher's son. She refused to handle snakes ever again, though Luke now runs a pet store and often encourages her to use her power again. Luke is mentally disabled, unable to make meals for himself without burning them, and relies on Jennifer since his wife died. While Luke runs the pet store, he spends most of the time in a back room, listening to Christian radio. Jennifer receives a scholarship to an upper-class girls private school. While at school, Jennifer encounters a clique of wealthy and cruel girls, who hate her for being poor and different. These girls turn others against Jennifer throughout the movie, but Jennifer also makes friends of her own, including teacher Jeff Reed (Bert Convy). The wealthy girls' cruelty eventually pushes Jennifer over the edge, causing her to use her special powers again for the sake of revenge against those who hurt her and her new friends. The film was released in theaters on May 13, 1978. Janet Maslin of The New York Times wrote that "all things considered, Jennifer could be a whole lot worse", and noted that "while Miss Pelikan is not Sissy Spacek by a long shot, she does have a suitably spooky look in her eye". TV Guide called the film a "blatant Carrie rip-off". The film was released on DVD and Blu-ray by Kino Lorber on October 14, 2014. ^ a b "Jennifer (1978)". Blu-ray.com. Retrieved 21 July 2016. ^ Maslin, Janet (13 May 1978). "Movie Review -- 'Jennifer,' Sister Film To 'Carrie'". The New York Times. Retrieved 21 July 2016. 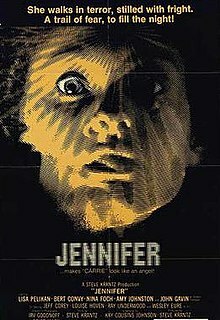 ^ "Jennifer (1978) - Movie". TV Guide. Retrieved 21 July 2016. This page was last edited on 19 December 2018, at 04:39 (UTC).